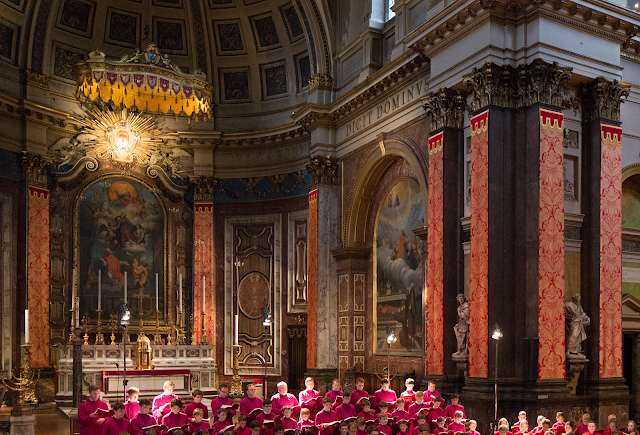 The Church of the London Oratory, or what is more properly the Church of the Immaculate Heart of Mary in South Kensington in London, is notable as a gem of sacred architecture, sacred art, sacred music and sacred liturgy. 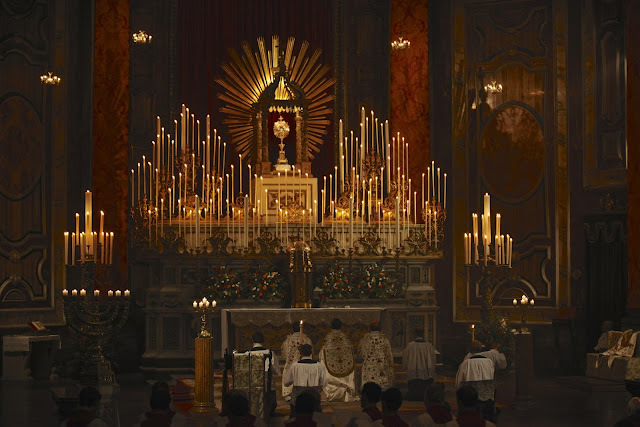 Most of us are already familiar, at least in passing, with its famed nave and high altar, but surrounding that are a series of smaller side chapels which may be less familiar to readers. The intent of this series is to give some focus to the lesser seen sights of the London Oratory, however, before we proceed to that, let's give a little well deserved attention to its better known venues first, beginning with the high altar. 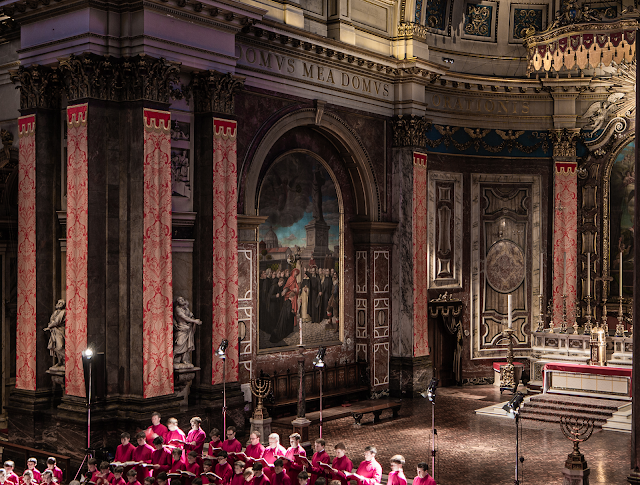 The high altar of the London Oratory is situated in a sanctuary that is more than 70 feet in its total depth. 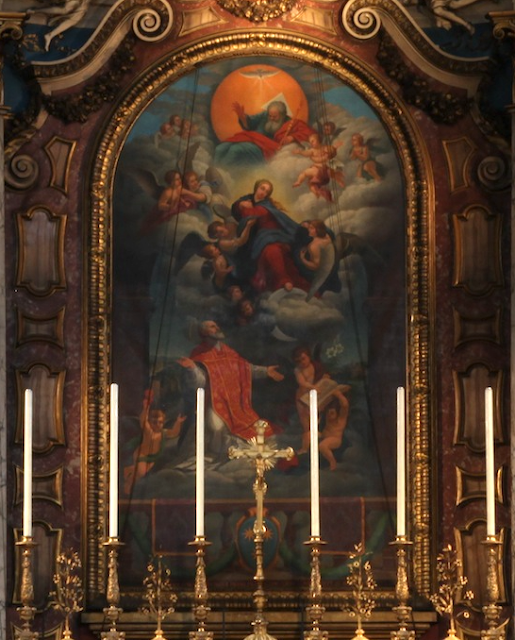 Above the high altar is painting which depicts St. Philip Neri -- founder of the Oratorians -- which is based on an altarpiece by Sebastian Conca (1680-1764) which is found in Turin. 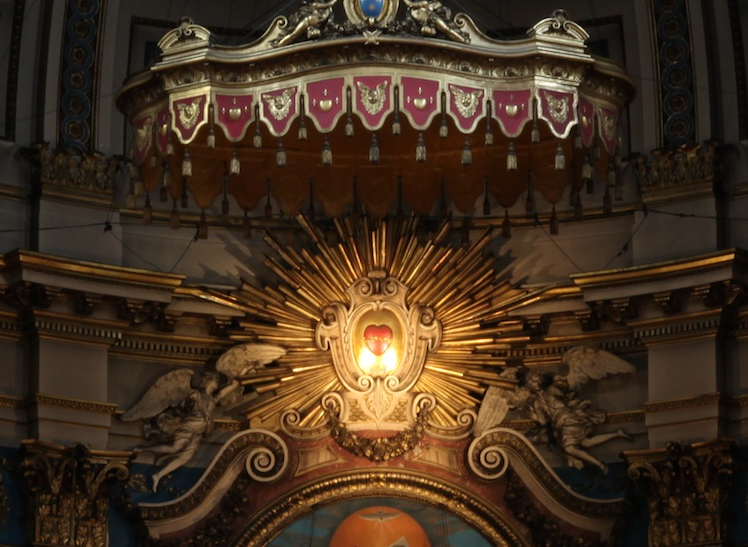 Above this is a sculptural representation of the Immaculate Heart of Mary, held a loft by two angels which were donated to the Oratory by Sir Edgar Boehm. 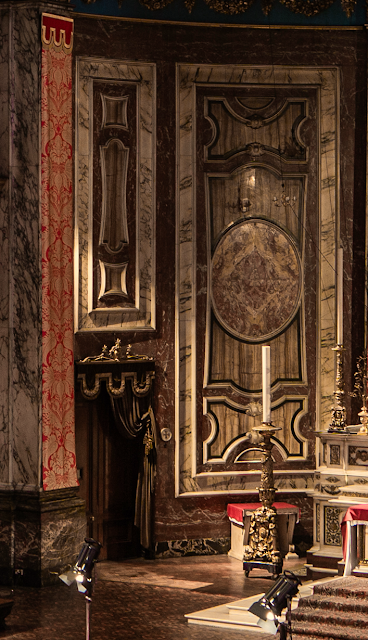 Above the altar itself is the altar canopy which bear the arms of St. Philip. 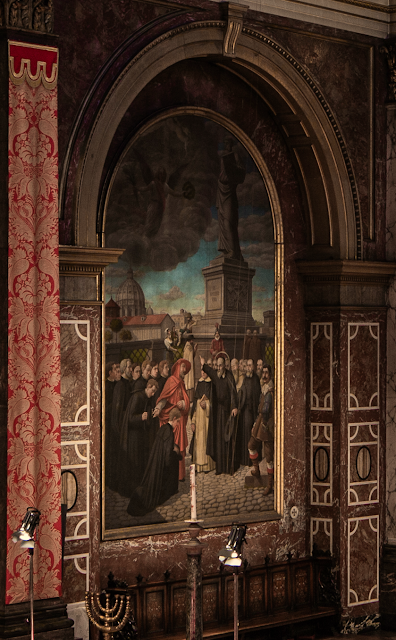 To each side of the sanctuary are two further paintings which were painted by B. Pozzi in the 1920's which illustrate scenes from the life of St. Philip Neri. 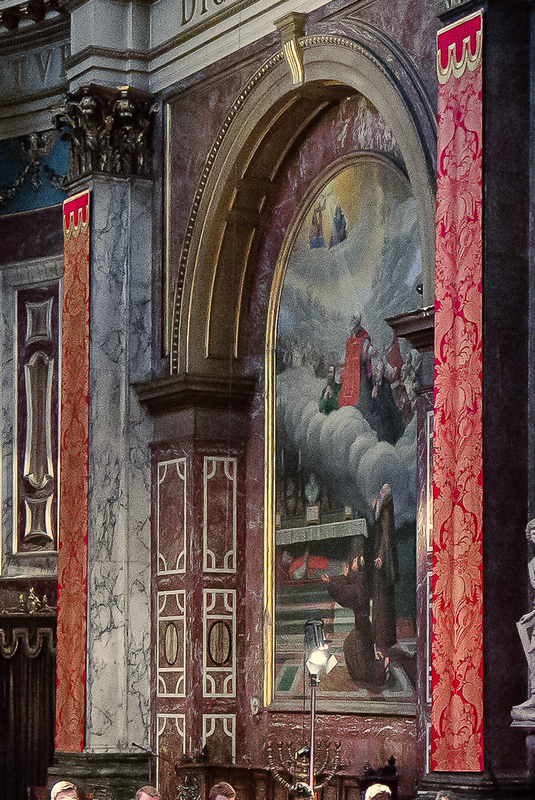 To the left, St. Philip blessing seminarians of the Pontifical English College in Rome; to the right, St. Philip leading his followers to heaven. The painting to the left side of the sanctuary includes an image of the Tower of London, a reference to the many Catholic priests who were martyred in England after returning from Rome. 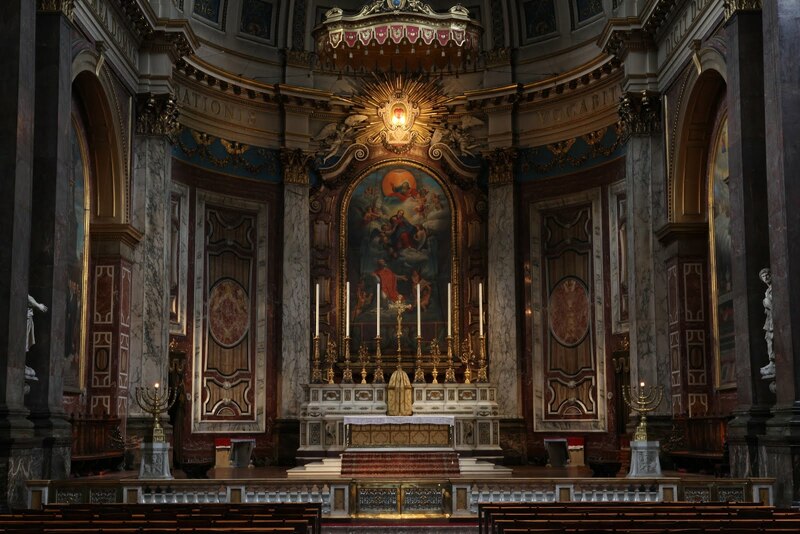 Below these are the choir stalls of the sanctuary which are decorated with inlaid ivory. These, along with the inlaid wood floors of the sanctuary itself, seen below, were a gift of the Dowager Duchess of Argyll. 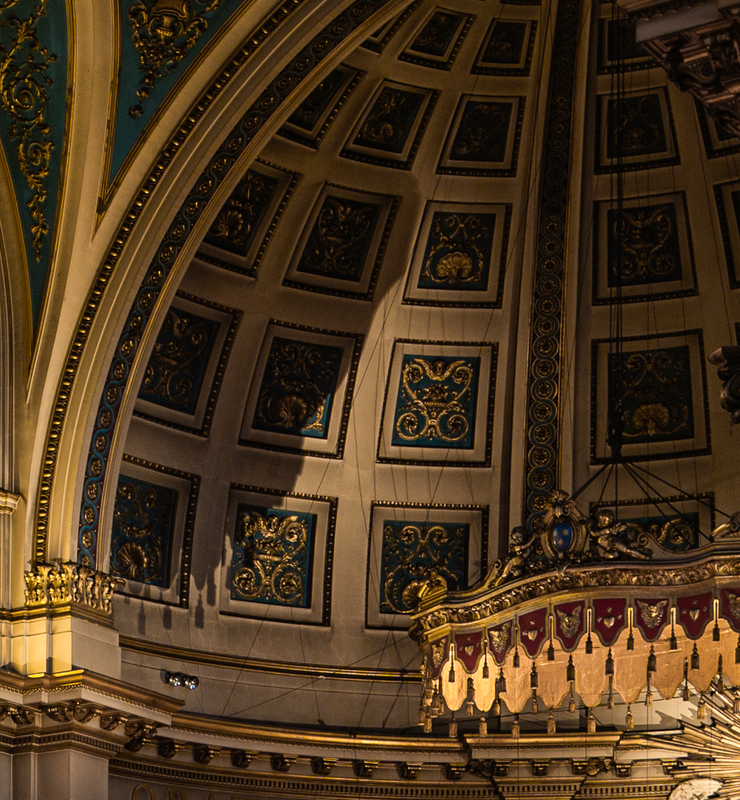 On either side of the sanctuary, positioned close to the Sicilian marble altar rail that separates the sanctuary from the nave, are bronze Menorah designed by William Burgees and donated to the Oratory by the Third Marquees of Bute, John Crichton-Stuart.. These Menorah are modelled after those which were found in the Temple of Jerusalem as depicted on the Arch of Titus found in the Roman Forum. By way of an aside, behind the high altar itself is an interesting bit of working Victorian engineering that is worth mentioning. This is utilized during Solemn Exposition of the Blessed Sacrament to raise the throne of exposition. Two final details showing some of the additional art found in the sanctuary. 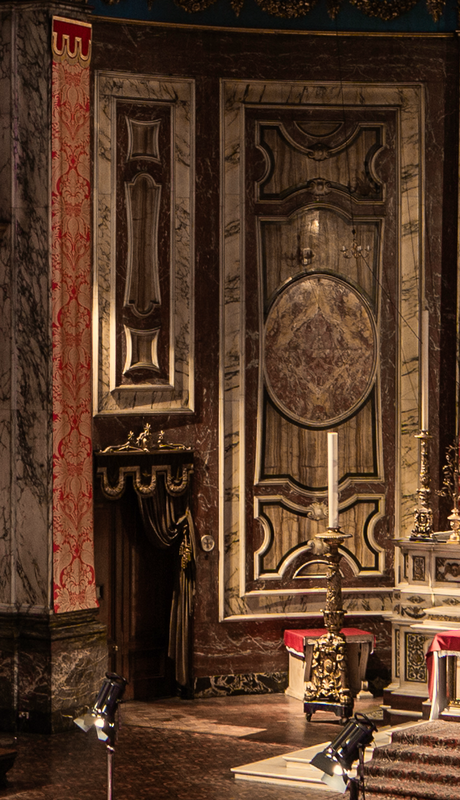 One can see here the "standards" (large floor candlesticks) in the sanctuary. The doors (found on both sides of the sanctuary) lead into the sacristy.